Title: Calzaghe v Lacy "Masterclass"
On March 5th 2006 the longest reigning champion in the sport of boxing, Joe Calzaghe continued his winning streak by scoring a one-sided and dominating 12 round unanimous decision over Jeff ''Left Hook'' Lacy at the M.E.N. Arena, Manchester, England. The WBO Super Middleweight king Calzaghe dominated virtually every exchange with the American favourite and IBF title holder Lacy over the distance. Calzaghe's superior hand speed, lateral movement and devastating left uppercuts repeatedly battered Lacy, he showed that he is a master of distance and timing opening deep cuts over both of his eyes and nose. 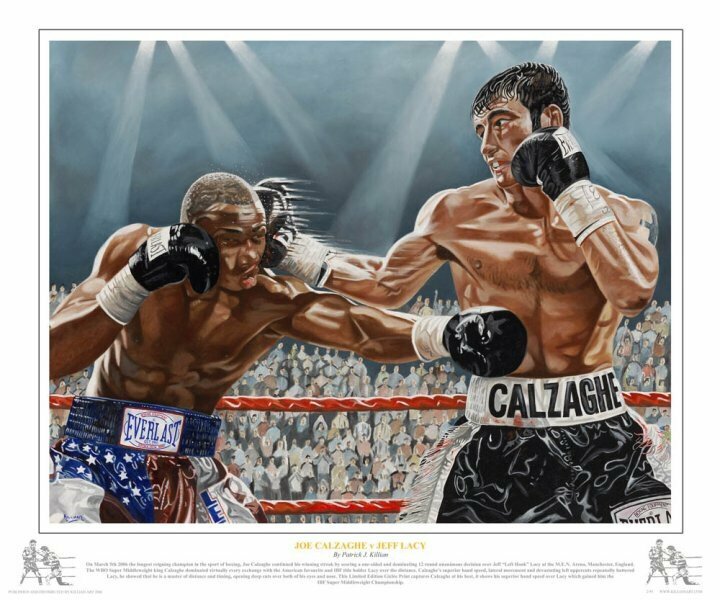 This Limited Edition Giclée Print captures Calzaghe at his best, it shows his superior hand speed over Lacy which gained him the IBF Super Middleweight Championship.